What the hell is he talking abooot? 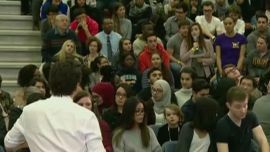 “We like to say ‘peoplekind,’ not necessarily ‘mankind,’ because it’s more inclusive,” he said. This entry was posted in Extreme Far Left, Fools and Puppets, Hypocrisy and tagged mankind, people kind, Trudeau by jeffchidester. Bookmark the permalink.